HE HAS been called ‘The Hairy Baby’. It’s a mystery no one has yet called him ‘The Bearded Wonder’. What is absolutely certain though, is that Steve Bennett is Irish Comedian Of The Year 2016, Róisín Dubh Comedy Clubh MC, and a serious comedic talent, with the potential to go far in the business. At last October’s Vodafone Comedy Carnival Galway, Steve was crowned the inaugural winner of the prestigious new Irish Comedian Of The Year competition. It was a well earned victory for the young man, a recognition of both his talent and the long hours and hard work he has put into his art and his career. Steve emerged on to the Galway comedy scene in the early years of this decade, before getting regular appearances at the Edinburgh Fringe festival, presenting the shows Passion, Pints, and Potatoes (with Christiane O’Mahony ) in 2012, and the solo shows In Bits (2013 ) and Groan Up (2015 ). In 2014 he won both Show Me The Funny and Best Newcomer at the UK Musical Comedy Awards, and in late 2015 Steve landed the gig as MC of the Róisín Dubh Comedy Clubh, which runs every Friday night at the Dominick Street venue. 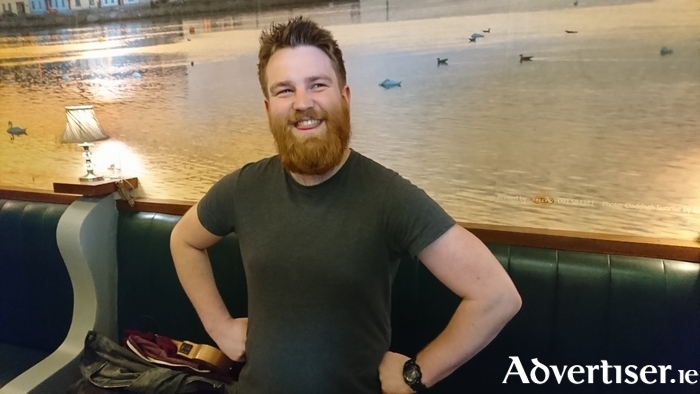 He was already on the upward trajectory, but winning Irish Comedian Of The Year has taken Steve a significant step further up the comedy ladder, and led to his playing shows at the Perth and Adelaide comedy festivals in March. Steve was in Australia for 11 and a half weeks in total, with only a day off here and there between gigs. “It was so much work, but that’s why it was an amazing opportunity, you couldn’t sit there and be in awe of it all,” he says. Australia also saw some unscripted slapstick moments and unintentionally funny incidents, such as when Steve was introducing Scottish comedian Rosco McClelland. Tomorrow the clubh will host Abigoliah Schamaun, said to be the only stand-up comic who is also a yoga instructor. An American, based in London, The List rated her in its Top 5 of today's up and coming female comedians, and said “There can't be many acts with as much sass as Schamaun." Forthcoming shows at the Comedy Clubh are from Northern Irish comics Micky Bartlett, Shane Todd, and Colin Geddie (May 19 ); Karl Spain (May 26 ), Danny O’Brien (June 2 ), Kevin McGahern (June 9 ); Sharon Mannion, Emman Idama, and Alan Hurley (June 16 ); Damien Clarke (June 30 ), and Gearoid Farrelly (July 7 ). There will also be shows from Deirdre O’Kane and Jarlath Regan in association with the Galway International Arts Festival. Doors for Abigoliah Schamaun at the Róisín Dubh Comedy Clubh tomorrow are 9pm. Support is from Aidan Greene and Ruth O’ Kelly Hunter. Tickets are €10 from Róisín Dubh; [email protected], Shop Street; and www.roisindubh.net; or €12.50 at the door.